Larb Koong (Spicy Shrimp Salad) for afternoon snack in Vientiane, Laos. A relative came by for a visit during the weekend and brought a bucket full of freshly caught shrimps. My two aunts decided Larb Koong, the raw and the cooked version for everyone to enjoy. Of course, the men ate the raw version with their BeerLao. Wow, I am hook with the wonderful Lao food pictures that I have and have not seen or have and have not eaten before growing up in California. Thank you for sharing. I am curious? Can you comment on Laotian in Holland, are their many there? Thank you for your visit. 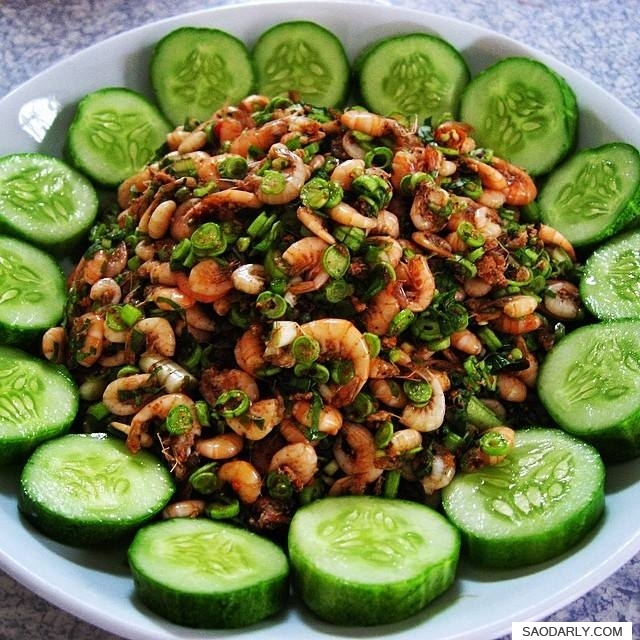 I’m happy to know that you saw something new about Lao Food. With such a big Lao community in California, I would think you have eaten them all. In Holland, I only know a few Laotians here. If there are more than 30 of us here, that would be a big news.